Multicaptures Chess: A piece (including royal piece) can be captured only if it is directly attacked in at least in 2 ways. Otherwise, it is invulnerable. (the theme of the Christmas Tournament 2006-07). 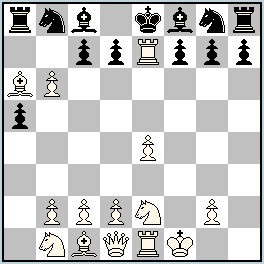 1.a4 e5 2.a5 e4 3.Ra4 e3 4.Re4 Qh4 5.Re7 exf2 6.e4 b5 7.axb6 e.p. a5 8.Ba6 f1=S! 9.Se2 Sxh2 10.0-0 Qe1 11.Rxe1 Sf1 12.Kxf1. Is the definition correct. Attacked at least twice, NOT capturable, otherwise INvulnerable. ?? Oh, sorry! The definition is corrected now! Multicaptures genre is checked by WinChloe only (I guess). Bc8 is missing on the diagram position ! Obviously, a bBc8 is missing. Thank you, Nicolas. I’ve corrected the diagram (+bBc8), and number of pieces (14+13).